Last year Chicago's Village debuted with Minimal Animal, a strong set of tunes that split the difference between '60s-styled psych rock and jangly power pop. It was one of my favorite releases of 2010, so just a few months after it dropped I was very pleasantly surprised to find out that the second Village LP, Local Moves, was already set for an early 2011 release. While Minimal Animal came together after singer/guitarist Stephen Ucherek dissolved his previous band The Living Blue and began writing and recording new material mostly on his own, its follow-up, out now, was more of a group effort. It is the first Village release featuring the band's since-formed live lineup; joining Ucherek are guitarist Kevin Smith, drummer Joshua Lucas, bassist Allissa Hacker and Mike Racky on pedal/lap steel. This definitely gives the record a fuller, tighter feel, but at its core it picks up right where Minimal Animal left off, with the same sort of garage-meets-psych-meets-pop vibe and an equally strong - maybe stronger - batch of songs. Although some tracks on Local Moves have immediate hooks and others take a few listens to sink in, none are worth skipping. The band name-referencing, mid-tempo opening track “Villagers” sets the tone with a jaunty melody and a bit of twang. “The Days Are Gifts” is a solid garage-rocker with some impressive, blistering guitar work, while “Sore Eyes” and “A Bit of Relief” are power pop that’s as impassioned as it is infectious. Mid-way through the sounds get a bit heavier; “Love on a Whim” introduces a bluesy crunch while the next few tracks venture into hazier, more psychedelic territory that reveal more with every listen. Even when things slow down with the rainy day introspection of “Panoramic Visions,” the record never comes anywhere near boring, and the upbeat optimism of “Behind the Rain” offers a satisfying end to it all. There's a few different moods and styles at work here, but one common denominator is an emphasis on guitar. Guitar rules over this rock and roll village, whether it's jangly, bluesy, or psychedelic. No matter what form it takes, it's always up front, impressively played and brings a driving energy to the material. This, along with consistently excellent songwriting and a strong showing from all of the band's members, makes Village's sound so grabbing. It's still early, but I'm pretty sure when the time comes to write about the best releases of 2011, Local Moves will make my list. 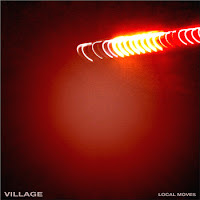 Village are currently offering Local Moves in its entirety for free download on Soundcloud and Bandcamp. For a taste, check out "The Days Are Gifts" below and keep an eye out for a music video of the track. You can also catch the band live on Thursday, March 3rd at the Whistler with Tiger Bones.